Have you always thought of driving with Grab? Do you want to earn more? Become a Grab driver partner this February and earn more than ever before – up to $1,070 a week in incentives! The earlier you join the more you earn. 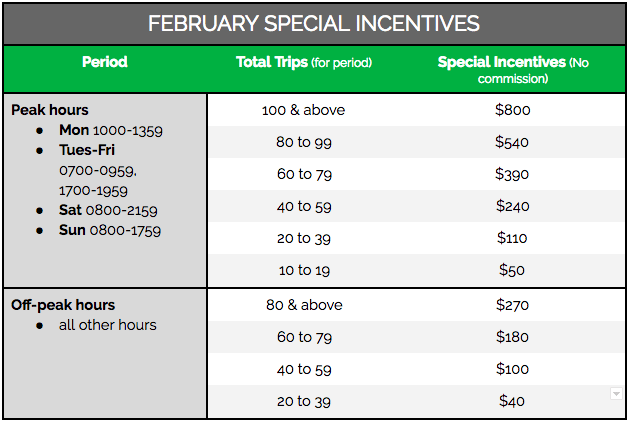 Up to $1,070/ week in incentives for the month of February. The earlier you join the more you earn! You could earn a potential of $4,280 in incentives just by driving 100 trips each week. And this is on top of your own earnings. But that’s not all, our multi-tiered incentive gives you the flexibility to choose how much you want to drive and earn. If you have time, try for the higher tiers. If you have time, try for the higher tiers. But even if you don’t, you will still be rewarded for your effort! AR (acceptance rate) must be above 80% and CR (cancellation rate) must be below 10%. Applies only if new partner owns his or her car / submits a valid original rental agreement dated at least 4 weeks prior to signing up with Grab. He or she must have completed at least 1 ride, during the week on another ride-sharing platform before he signs up with Grab. Expired rental agreements not eligible. Please submit the last 4 weeks of printed driver statements for verification.